Good news to all TNT subscribers who love to stream in YouTube, iWant, iFlix, Cigna and NBA. 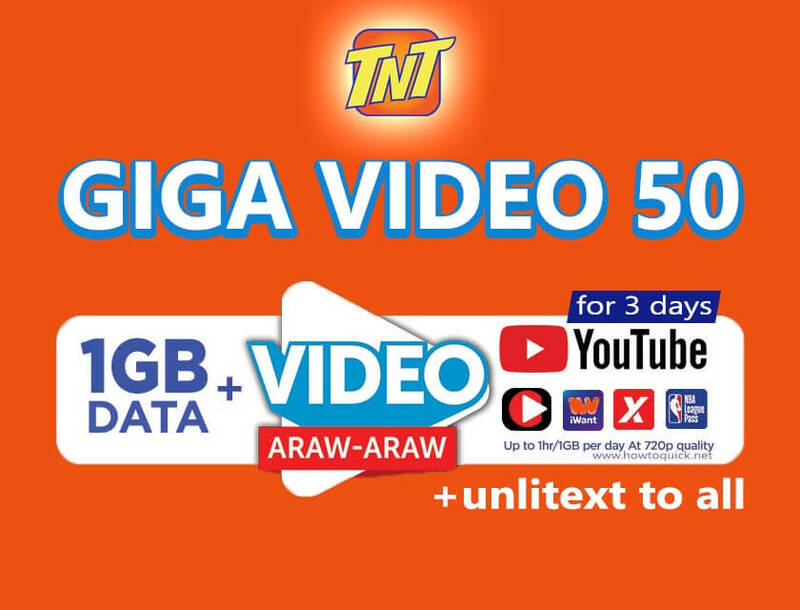 They can now enjoy up to 3 days of video content streaming access with the new GIGA Video 50 promo for only Php50.00. It gives you 1GB of data that you can use to browse your favorite websites and use your social media apps like Facebook, Twitter, IG and other more. You can also use your allocated GB of open access data to play games like COC, Mobile Legends, ROS and other online multiplayer games. You can also enjoy unlimited texts to all networks that you can use to connect with your friends and love ones without registering to another promo. You can subscribe to this promo via SMS keyword or through the USSD code menu using your Talk N Text SIM. Just text GIGA50 or GIGA 50 then send to 4545. This promo formerly known as Gigasurf 50, which now includes the free YouTube every day, or we call it Video araw-araw. You can also share some of your MB from your 1GB data using the TNT Pasadata – share data to Talk N Text & Smart subscribers. Before using the promo, make sure you receive the notification from TNT that’s says your subscription is already active and ready to use. This is to avoid an unwanted load charge, but if you still unable to get the notification, you can just simply do the TNT balance inquiry steps to check if your account has still enough balance to avail the package.